Home » Phenomenon » What is "Wedhus Gembel" ? "Wedhus Gembel" aka the sheep is not really a lot of animals reared in the vicinity of Yogyakarta and Central Java. However, the name sounds familiar wedhus trash for residents in the vicinity of Mount Merapi. "Wedhus Gembel" this is not a hairy goat, but nicknames for hot rolling clouds that often accompany the eruption of Merapi. Citing Investigation and Technology Development Agency Kegunungapian (BPPTK), Merapi hot clouds consist of two parts. First, the rock fragments of various sizes, including the size of dust, and second, the blob of gas temperature 200-700 degrees Celsius. These two aspects are mixed in a turbulent flow rate of more than 80 miles per hour. Which killed many citizens of the slopes of Merapi some time ago even reach speeds of 200 km per hour while down from the ridge. Volcanic ash cloud spread from the hot flying and deposited by wind magnitude and direction. Hot clouds sliding distance generally depends on the volume and the formation and move to follow the topography and valley sungai.Volume greater will reach more remote areas due to the influence of momentum and other effects. No wonder when the big eruption, heat clouds can reach up to 15 kilometers. Pyroclastic eruption usually can flow as far more than 8 kilometers from the summit. In addition to volume, hot clouds sliding distance is also affected by higher temperatures, more gas content, and has a lateral initial velocity at maturity. With more gas conditions and high temperatures, "Wedhus Gembel" certainly destroy anything he encountered. 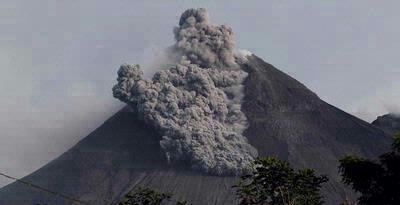 So whoever was around Merapi should not want to meet with the "beast" on this one.